Have you ever seen the garden through the eyes of a young child? Last Saturday we had our first ever Kid’s Day at Natureworks and I was honored to play with tons of wonderful kids, teaching them how to plant and joining them as they romped through the gardens, exploring. What we see everyday and take for granted, they see with wonder. 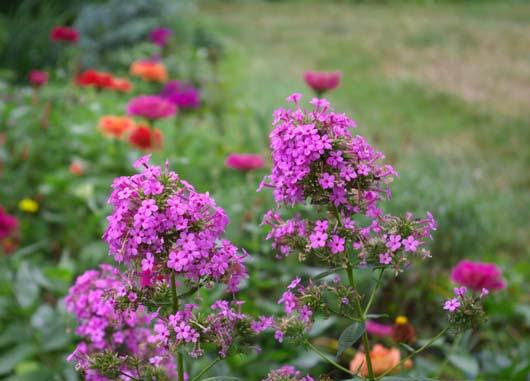 Phlox paniculata ‘Jeana’ is the best phlox ever! Covered with pollinators, long blooming, clean as can be. Here you see it blooming in a sea of zinnias in my side garden. LOVE! look out, and can’t believe how beautiful it is. Pictures can’t capture the life, the complexity of the many layers of color, texture, and diversity. My giant ‘Tosca’ hybrid rose of Sharon sets the stage for a self-sown red hibiscus, orange butterfly weed and coneflowers, blue hydrangeas, white queen Anne’s lace, and yellow Coreopsis. In the foreground is my “tropical deck” where I have staged all sorts of hibiscus, evening scented Cestrum nocturnum, and all kinds of other goodies. I especially love rubbing the leaves of my scented geraniums. Not only are they beautiful to look at, they smell so good! Create a garden, abuzz with life. 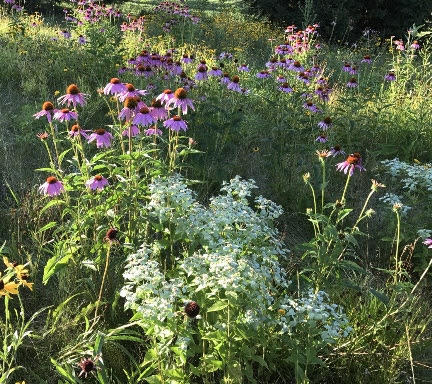 This is Diane’s meadow, complete with mountain mint (Pycnanthemum muticum), a real action plant for pollinators. I surround my veggie beds with mountain mint. We should be in awe. Creating a garden, abuzz with life, it’s the best gift that you can give yourself and your family. I am now eating from my garden every day. Monday I harvested elderberries, with more to come. The peppers are coming on strong, as are the smaller tomatoes- ‘Dancing with Smurfs’ is my favorite the year, going from deep purple to orange/red with a star at the base when ripe. Cucumbers, eggplants, and basil- sounds like dinner to me! 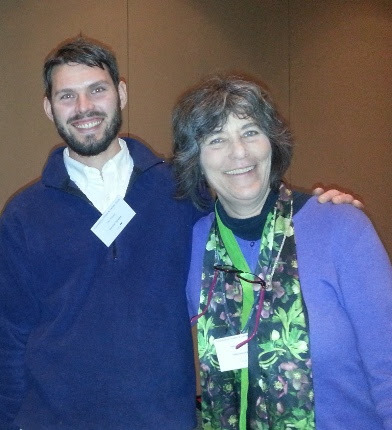 Dan Furman and I at the CT Flower Show a few years ago. That is when I first learned about the organic edibles he grows. 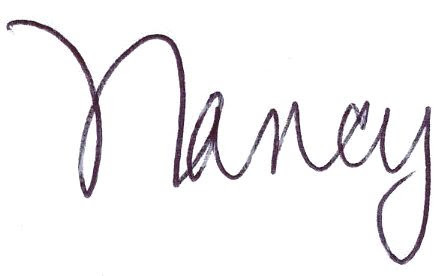 to sign up and you can read all about it. 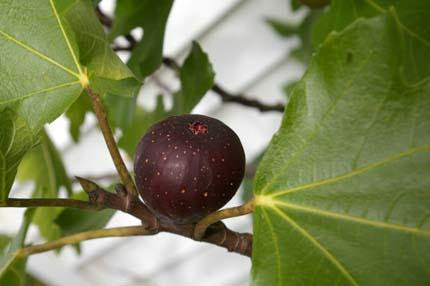 His nursery has a long and wonderful history and the story of how he came to be growing so many unusual types of edibles at a peony tree farm is fascinating! Look at all that beautiful organic garlic! It is all harvested and drying in my courtyard. That makes room for MORE EDIBLES! 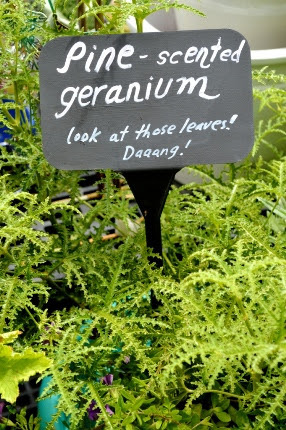 What are you planting this week? 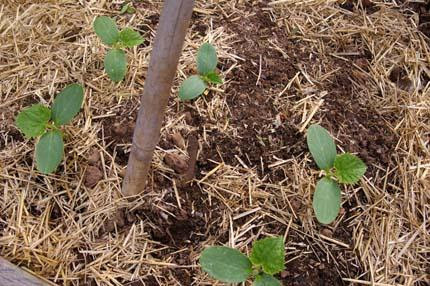 Plant seeds of summer squash and cucumbers now for a fall crop. The soil is warm and the seeds germinate fast! and so much more. Plus, you should be planting seeds. On Sunday, I filled an entire bed with beans- pole beans and bush beans, both green and yellow. You can still plant summer squash and cucumber seeds as well as all the greens you can think of. My ‘Cocozelle’ zucchini literally flies up out of the warm soil at this time of year! Plant more basil seeds in a clay pot so you can have fresh basil coming through the late fall. 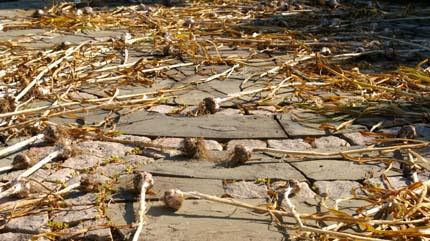 Keep on sowing cilantro and dill as they have probably bolted to seed already. We have everything you need including floating row covers and frames, super important to keep the cabbage moths from destroying your broccoli, kale, and other cole crops that thrive in the cool fall weather. This week’s Facebook Live will focus on planting edibles NOW for fall crops. Tune in at 4 pm or, better yet, stop by and be in the audience. We welcome your questions. All of our Facebook Live videos are archived on the Natureworks Facebook Page in case you missed them. Spread the word, tell your friends, this is an easy, fun way to learn. Make time to browse inside our shop. 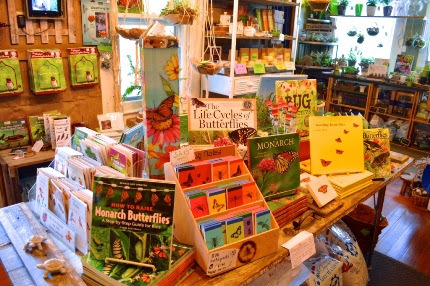 We have so many new items to see, including a great new book on monarch butterflies. and 9 and you will get a $5 gift card good for any purchase of $20 or more. As usual, we will be serving organic coffee to all the earlybirds. Shop at your leisure, browse inside the shop, and stay for Dan Furman’s talk. Carpool if you can, we are expecting a good turnout. Got monarchs? We do! As of today we have 24 chrysalises, 2 hanging J caterpillars (about to become chrysalises), 171 caterpillars from tiny to big, and tons of eggs, too many to count. 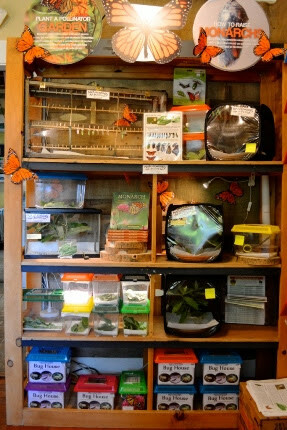 On the left you will see our monarch “nursery”. It is so much fun to teach our customers how we do this and why. All-natural herbal incense is back, by popular demand. 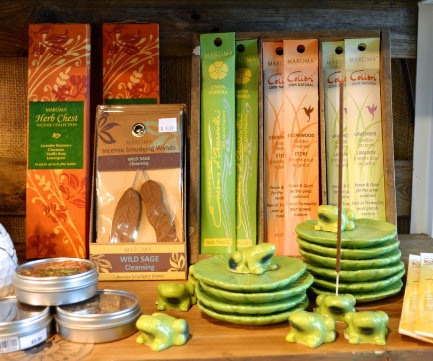 Aren’t those the cutest frog incense stick holders? Check out the wild sage smudge incense. Great idea. where mosquitoes will be a bother. 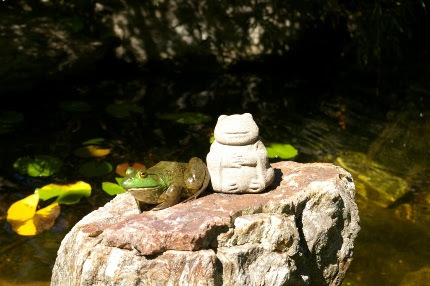 Cute meditating animals have arrived- I have two at home, one squirrel on my kitchen windowsill and the other, a frog on a rock in my pond. You can see that my real frog (a.k.a. Frogman) has made friends with him! It’s August, it’s turning out to be a lovely summer, and it’s AWESOME at Natureworks. Make time to stop by this week. 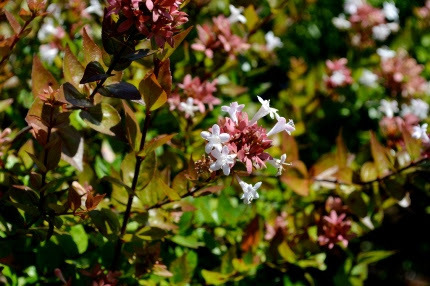 Glossy Abelia blooms for many months, attracts butterflies, and is disease and insect free. How I love this plant!